Thought you might like to see some of the finished sampler photos I received. I'm going to show several today and several tomorrow. They are all wonderful ideas! This sweet pillow is from Ivy. She used Crescent Colors Red Currant, Clay Pot and Gentle Arts Antique Rose. Ivy Green is her Grandmother who was born in 1899. Angela B. from Italy says, "I've stitched this with a French floss by Pomme de pin called Feu de bridget: it's overdyed in red tones. I've done it over one on a linen from my stash. I've stitched two birdies instead one and hope I haven't made any mistakes. And last, I've finished it in a tag shape." 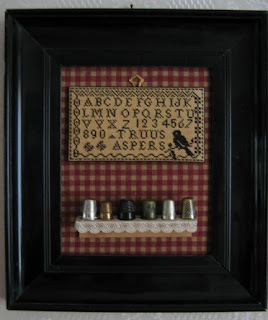 Truus de Wild from the Netherlands has placed her sampler in a shadow box. The checked fabric background is the perfect background for her thimble collection. Isn't her stitched bird sweet? Tamera says "Mine is stitched on banding with needlepoint silk and overdyed with tan Rit dye as is the trim. Some little friends from Notre Dame watch over it. I always stitch "PS I love you" on my pieces as my husband's initials are PS. This time it is done in french PS Je T'aime." Tamera, I love the small piece behind your finished piece too! You will have to tell us about it. 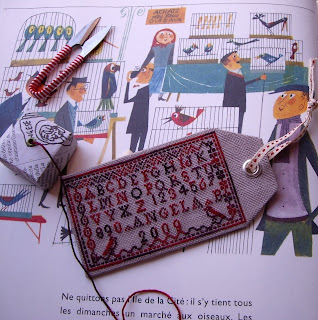 We love the idea of stitching secret messages in samplers. I will have to share some of the secrets that Barb has stitched into her samplers. Finally, I must show this piece to you. My youngest son came home right before Barb and I left for France and gave me this. This was stitched by the lovely young woman he has been dating. She wrote a note to me telling me she stitched this piece over spring-break. She looked on-line for instructions and decided to try stitching after seeing all of the samplers in my home. This is her first piece. As my eyes filled with tears, I told my son..."This is the girl I want you to marry!!!" Barb and I are working on a quilt pattern we will be sharing with you soon. So for all the quilters out there....don't give up hope. Your turn is coming! Also, Barb is sending me the disk with our France pictures...so those will be coming soon. Wow! Those are some lovely stitcheries! Thank you for posting them. Wow! That Amy is a keeper! I do love seeing all the samplers, everyone is so creative. Amy sounds wonderful, she did wonderfully on her first stitchery. WOWZERS! So many wonderful finishes.....such talented ladies. Amy is quite a gal. How sweet for you to be the recepient of her very first piece. Yup, she's a keeper. Thanks for setting up your blog so I can now post a comment. I'm so happy for your son! Sounds like Amy is wonderful...sigh. I was holding out hope that someday he and Elisabeth would hook but I approve of sweet Amy instead. Thank you so much for showing us all these wonderful inspiring versions of little Alice's sampler. How inventive and very creative everyone is. Like you, my eye went straight to the little intriguing piece of sttiching behind Tamera's lovely version. I love the gift from your son's girl! What a wonderful gesture. She must think an awful lot of you :>) It's so beautifully stitched. My son and his girlfriend are very fond of each other but I am desperately trying NOT to get too attached to her...haha! Lovely finishes and I can't wait to see the quilt pattern. Thank you for sharing these. Each one is truly lovely! How sweet that your son's girlfriend stitched you a sampler. What a thoughtful girl. 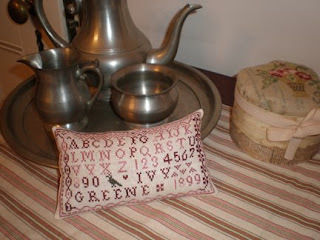 Great ways to mount the cross stitch. Hmm! how should I do mine. How sweet for your son's girlfriend to try her hand at cross stitch. I am sure she is hooked now. Sounds like your son has found the perfect mate! :D I love what she stitched for you! Great finishing on those freebies -- my favorite is the one with the thimbles. These finishing ideas are great. Thanks for sharing. Amy's sampler is very nice as well, best of luck to both of them. Oh, I can imagine how the stitched piece from Amy touched your heart! What a very loving gesture from her! Thanks for sharing these lovely works but especially Amy's one !! How thoughtfull of her !! I can't realize I met you and Barb !! I'm still like in paradise. Thanks again, it was such a pleasure to meet you and your beautiful work. I'm in love with all these stitcheries and would love to learn how to do them. I think they are all superb but my favorite is Truus'. Great job everyone. I think Amy is a keeper as well. I love that bit about Amy - a keeper, says mom! That's so cute! Of course she must've been intimidated to stitch for someone like yourself, but she did a lovely job! Very pretty! love the "and more" part. yep, she's a keeper! It's lovely to see how other people finished their samplers. And what a sweet gift from Amy! Fun to see all the samplers and GLAD to see there's a quilt project coming soon too! looking forward to seeing the pictures from your trip and the quilt exhibit/show. Yes, Amy is a keeper! that was such a thoughtful gift, one you will treasure forever. The stitching is all so wonderful and inspirational. Thanks for sharing the pictures! Beautiful finishes of many very talented ladies. I have to give the sampler a try as well. How sweet of your sons girlfriend to give you her first stitchery. She's a real keeper. so many creative stitchers out there! i love seeing the finishes! i've not had time to stitch your generous freebie but hope to one day! and amy...another future stitcher. what a thoughtful young woman! How fun to see all the projects made from the sampler. And one from your son's girlfriend! I keep telling my son he must find a girl who appreciates quilts! Speaking of quilts - I would love to see a post with pictures of Love Letters. 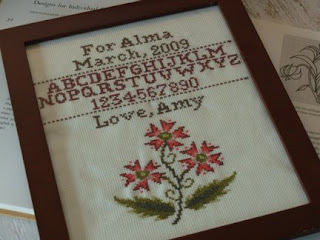 Beautiful and creative finishing for the little Alice sampler. 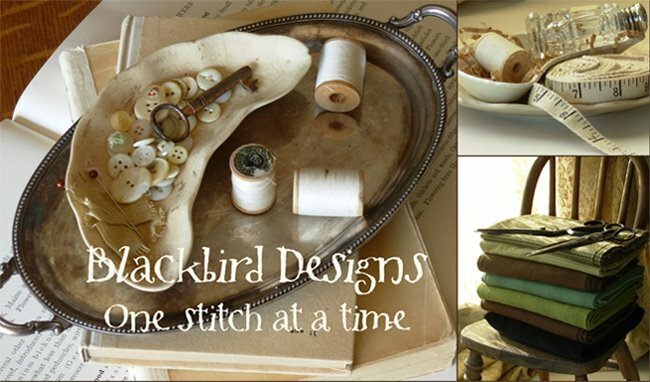 It's so wonderful how BBD and stitching/quilting bring so many wonderful people together. Amy sounds like a doll - what a generous and caring young woman she must be - truly a gem!